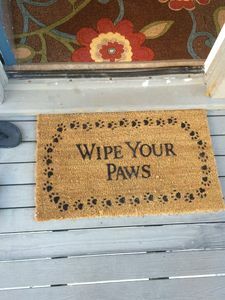 Take a short walk to the Beach over paved sidewalks. Stroll over to PD Outfitters, rent a Bike, rent a Kayak, or charter a Fishing boat on the 11-mile Lagoon that passes behind our Condo. Try your hand at Tennis, about 200 yds from our Condo. We'll give you 2 hours/day free Tennis. Go down the street and enjoy a round of Golf at the Fazio Golf Course. There is so much, much more to do, just around the corner! There is always no extra charge for Holidays. 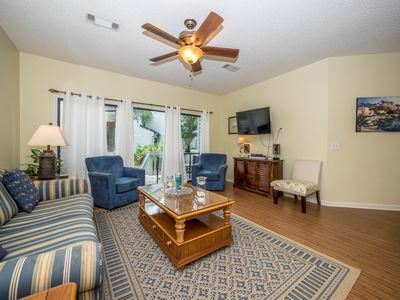 Towels & linen, all utilities, wi-fi, 2 hours/day free Tennis, discounts on Golf, discounts on rental of bikes, canoes, kayaks, and 1 gate pass are included in rate. We typically rent from Saturday to Saturday. Our Centrecourt villa is relatively new to the vacation rental market. It has previously been owner- occupied by my wife and I as a vacation getaway. 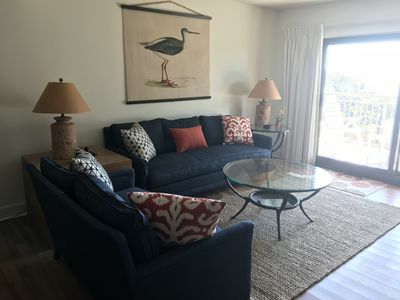 The villa is centrally located, within easy, short walking distance to Tennis, Golf, Kayaking, Fishing, Biking Trails, and a private Beach access. Our private community Pool is on site, about 100 yards from our front door. 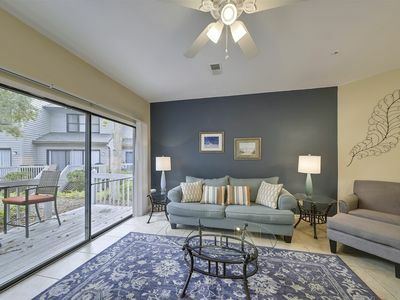 Our villa is well appointed in a bright and cheerful Beach motif within the gated community of the Palmetto Dunes Resort in the heart of Hilton Head. 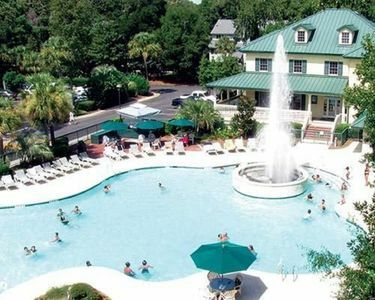 Hilton Head is regarded as one of the nicest family vacation resorts in the U.S. It has received high praise from Travel & Leisure magazine, as well as considered within the top 100 golf resorts in the country, and #3 Tennis resort ranking in the world. 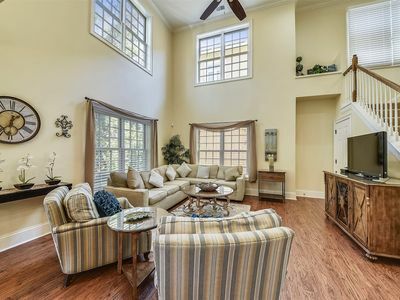 Our airy 1300 square feet, smoke-free villa offers an open, spacious floor plan, with new hardwood flooring. There are two large, private bedroom suites within the villa. Each suite has a spacious bedroom, vanity, dressing area, bathroom, as well as a flat screen HDTV with cable. 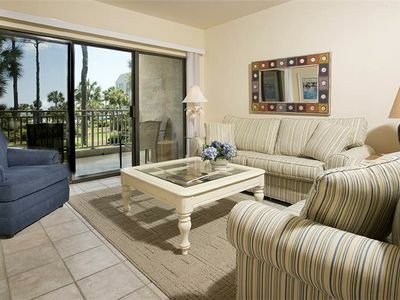 One bedroom has two queen size beds, while our spacious Master Bedroom has a comfy King Size bed and a sitting area with an over-size lounge chair and a small desk area. There are Allergy Protectors on all beds. 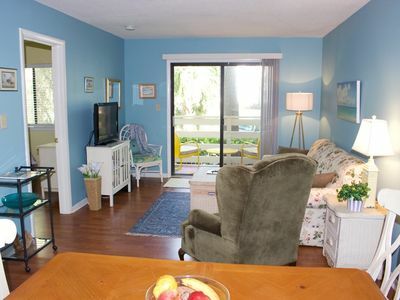 A flat screen HDTV with cable is in each bedroom, with a DVD player in the Master Bedroom and the Family room. Our villa has FREE, Wireless Internet service throughout, including our back Deck. We have recently installed fiber optics throughout our villa to further enhance our TV reception and internet speed. 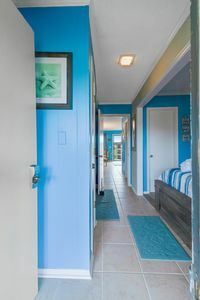 The bedroom suites are separated by a large, open dining area and a vaulted-ceiling family room to give you and your guest’s complete privacy. In addition to a queen-size pull-out couch that can sleep two, the family room has over-sized lounge chairs and an entertainment center with HDTV and DVD. 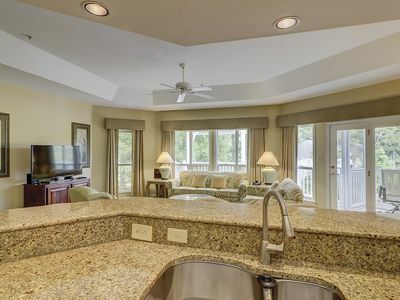 From the family room, the floor plan opens up to our large and secluded, covered deck, overlooking the 11-mile lagoon that winds its way through Palmetto Dunes. Our deck has a ceiling fan to give you extra comfort on a particularly hot day. The kitchen area is to the left as you enter the villa. 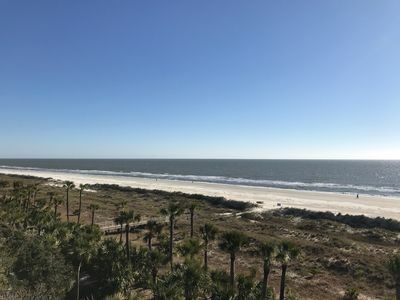 It is fully equipped and stocked for your vacation needs including a refrigerator, dishwasher, disposal, small appliances, dishware, and an enclosed washer & dryer. 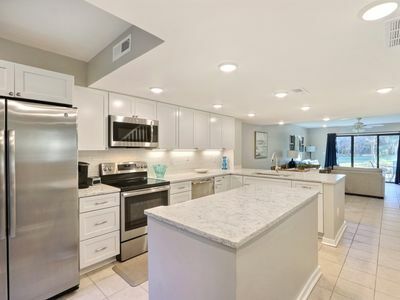 It features a counter area with two bar stools that open into the spacious dining and family room areas. A new community GRILL has been installed on the edge of the parking lot in front of the Centrecourt buildings. 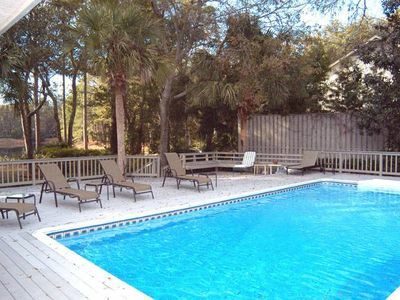 Our villa is located within a small, private group of villas, called Centrecourt, in the heart of Palmetto Dunes and near the ocean. Centrecourt is ideally situated. 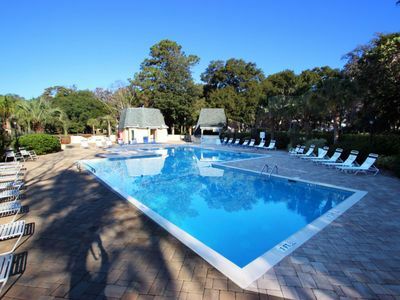 In addition to its own private pool, it is just a short walk to tennis, golf, kayaking, canoeing, fishing, and clearly one of the best beaches on Hilton Head. You may choose to relax on our own secluded, large covered deck that overlooks the 11-mile lagoon. 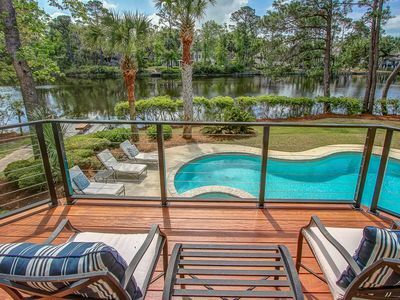 The lagoon flows along fern and tree shaded banks as it winds its way throughout the entire Palmetto Dunes Resort. In time, you will see a great variety of wildlife, including Blue Herons, Egrets, Ospreys, and an occasional “gator”, to name a few. Later, you may wish to boat or go fishin’ in this stocked lagoon. Kayak, canoe, even guided fishing charters, are all available at the Palmetto Dunes Outfitters Rental shop, just a short walk (or drive) from the villa. We offer our guests DISCOUNTS on all sorts of outdoor activities-- rental Bikes, Kayak & Canoe rental, Golf, & Tennis. Did I mention the BEACH??? 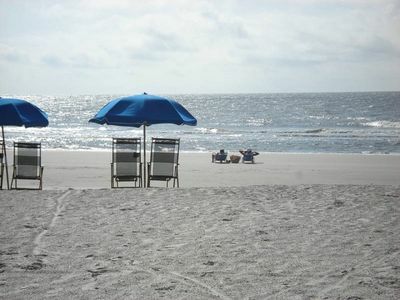 The beach at Palmetto Dunes is 3+ miles long and is considered by many to be the finest beach on Hilton Head. 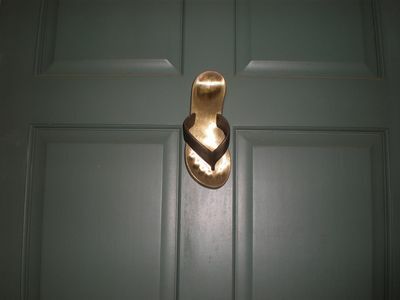 The Beach is just an easy 5-8 minute walk over paved sidewalks, or a short drive from our villa- about a quarter mile. 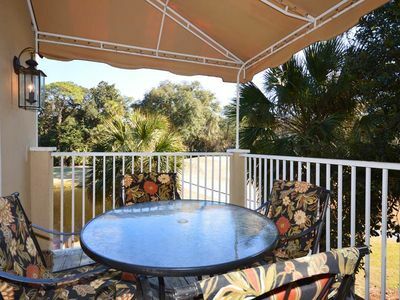 Once there, as our guest, you have free access to the private Palmetto Dunes/Disney Recreation Pavilion with free parking, picnic tables & grill, a snack bar, and restrooms. If TENNIS is your game, we'll give you up to two (2) hours of FREE tennis per day at the Palmetto Dunes Tennis Center, plus other DISCOUNTS on tennis activities. About 300 yards from our villa are 8 courts of the Palmetto Dunes Tennis Center. About a quarter mile further are 17 more courts of the Palmetto Dunes Tennis Courts, with 15 clay and 2 hard courts (8 are lighted) as well as special activities such as tennis clinics for adults and children alike. If you love to play GOLF, you’re in the right place. There are 3 superb 18-hole courses within Palmetto Dunes, including the Fazio Course, about 500 yards from our villa, as well as Arthur Hills and Robert Trent Jones just a short way down the road. We offer our guests DISCOUNTS on all 3 courses. 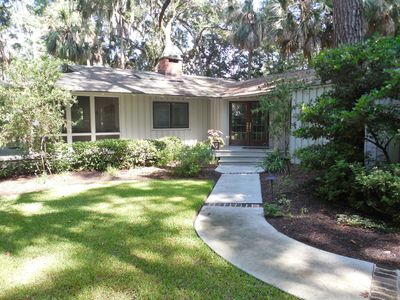 All together, there are about 27 semi-private and public courses in the Hilton Head area for you to choose. If you enjoy taking a BICYCLE ride, this is the place. We offer our guests DISCOUNTS on bike rental. Hilton Head has miles and miles (about 32 miles) of paved bicycle paths that will take you to large portions of the island. Bikes are also allowed on the Beach. Bring your own bike, or, for your convenience, bike rentals are available at Palmetto Dunes Outfitters Rental Shop, just a short walk from the villa. If you look forward to a day out SHOPPING, Hilton Head will not disappoint you. Numerous retail shops and boutiques abound throughout the area, to include the shops at Shelter Cove Marina across the street from the main entrance to Palmetto Dunes, as well as the Tanger Outlets just off-island with literally 100’s of outlet stores. Also, there a number of very good RESTAURANTS nearby. One of the most popular restaurants, Alexander's, is just across the 11-Mile Lagoon bridge near the rear of our villa. 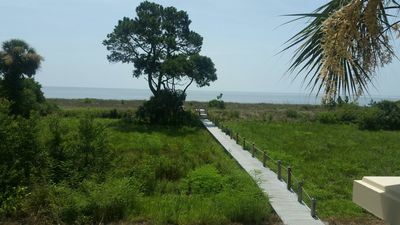 Shipyard Plantation - The Greens - Steps to the beach! 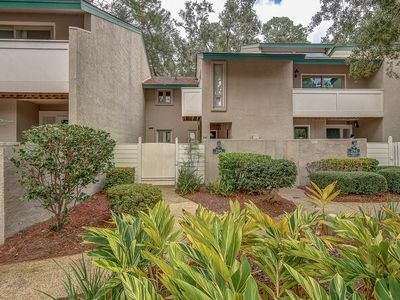 2 bedroom, 2.5 bath townhouse that is just steps away from the on-site swimming pool.